School Psychologist Discounts | American Professional Agency, Inc.
Our School Psychology program offers coverage to individuals who hold degrees in a wide variety of modalities. Discounts are available to you, providing you meet the requirements. Please contact our customer service department if you have questions about discount qualifications. (20 hours or less a week). 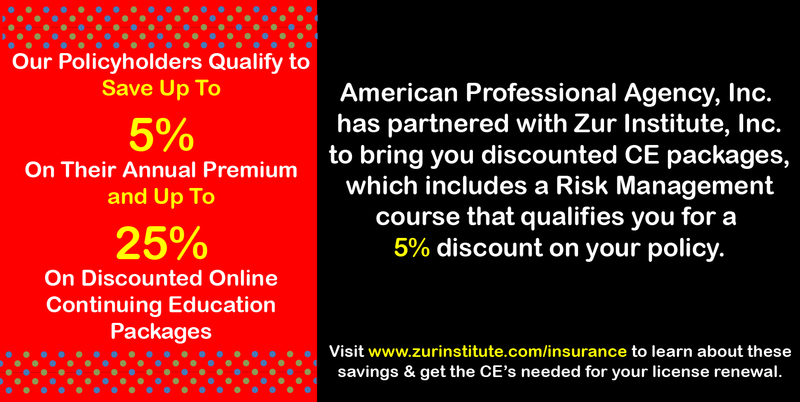 You can now save 5% on your insurance premium by taking online risk management courses. To assist you in obtaining your premium discount, we have negotiated a special benefit exclusive to our clients. APA, Inc. Policyholders receive an unlimited 10% discount on all courses taken at BehavioralHealthCE.com. Simply obtain the current discount code in your renewal packet or contact APA, Inc. or BHCE. All BehavioralHealthCE.com courses are completed online. Unlike other CE providers, all BHCE courses can be viewed for free prior to purchasing your CE credits, so your satisfaction is guaranteed!